It's hard to believe that it's already September, and time for another fun challenge at DL ART. For those of you who are followers of Diana's blog, you may know that she has started making and selling her lovely crinkle ribbon here in the DL ART Store. It's been a lot of fun playing with Diana's lovely crinkle ribbon and twine, and I hope that you will check out her wonderful little shop. I created my card using some patterned papers that I machine stitched together. Since I have so many vintage laces in my stash, I decided to try my hand at making these sweet little hearts I saw on Pinterest. I took some scrap pieces of canvas, cut them into heart shapes, and then laid several different vintage laces over the top, along with some vintage buttons. They turned out SO soft and sweet with a romantic feel. The crinkle ribbon I used really compliments them nicely. 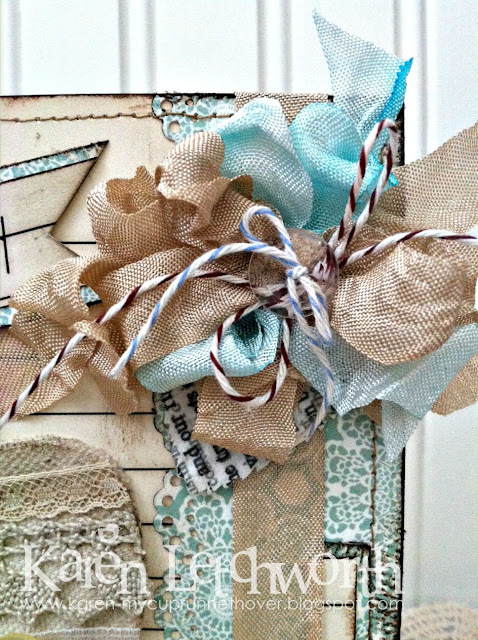 I used Latte Crinkle Ribbon and Aruba Blue Crinkle Ribbon in my bow, along with a length of Brown Twine. I also ran some of the Blue Twine through a clear button that I placed in the center of my seam binding bow. I added a few little pearls as accents, and my sentiment is a rub-on that I placed on coordinating papers. I inked everything to give it a shabby chic feel. I just LOVE the vintage laces, and it was awesome finding a creative way to use them. I love sharing close-up photos so that you can see all the wonderful textures and colors. It really helps you to see the fine details. I love how the canvas hearts turned out, and I encourage you all to try your hand at something new like this. It was a lot of fun. Live and Love Crafts - Challenge #39 Photo Inspiration - I absolutely LOVE this romantic feel of this photo inspiration with all the elegant laces, and soft touches. Looks like you got your mojo back!! This is gorgeous!! Great job! 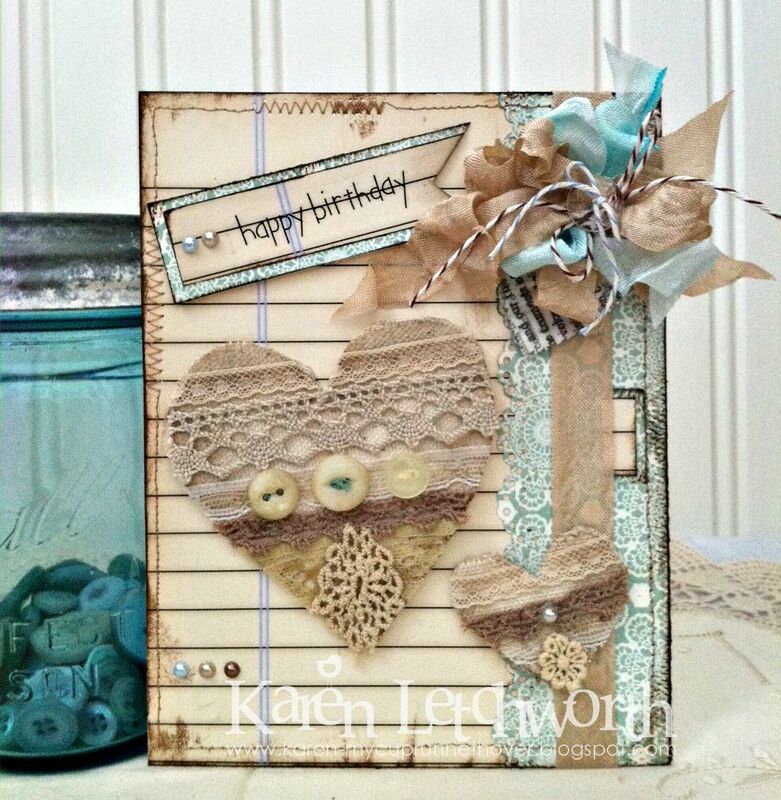 Lovely card creation and welcome to the team my friend! Have a blessed day! This is unbelievably amazing! I love every inch! Did you stitch the lace to the heart or glue or iron on adhesive? Do tell! I love this! Perfect creation, Karen! Congratulations, Karen! Diana is truly blessed to have you and I'm excited to see your creations on her sweet blog. :o) Your card is stunning! I always swoon over the shabby hearts I see all over Pinterest... and yours is equally lovely. :o) You've used Diana's ribbon so beautifully, too. Stunning! Congratulations again and thank you for sharing your creativity with us at Live & Love Crafts! I am a huge fan of Diana and she is one of the most people that I know in bloggy world. I am so Happy that you are part of her DT! Congrats to you my friend!! A gorgeous creation as always! So pretty Karen. I love all of the texture. I am happy to be on the design team with you. 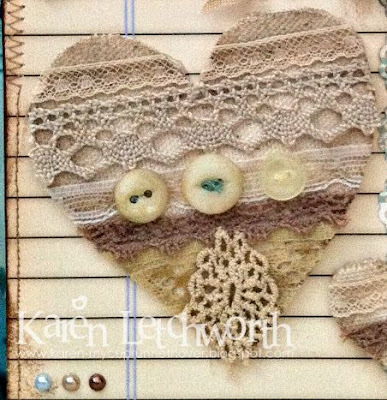 What a gorgeous card Karen - love the colours and the texture you have going is amazing - love, love, love, those hearts!! I love the color combo and the fun textures! The hearts are so amazing and just love the overall look! This is a fantastic way to use lace; the hearts turned out great! Love the whole composition of the card and the shabbiness; so many gorgeous details to look at. 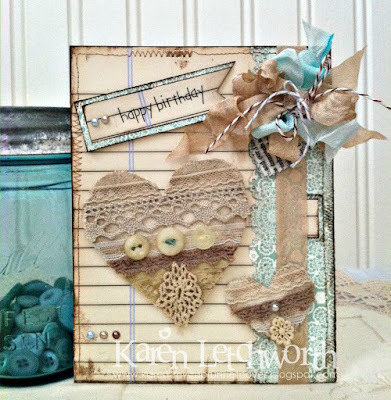 Thanks for joining LLC for our Photo Inspiration Challenge; your card is an awesome take on it!